Fysa aim to marry theatre with political activism and if E15 sometimes feels more like a protest than a play, it is nothing less than a rallying cry, a call to action. Using verbatim dialogue from a range of sources, Fysa tell the remarkable true story of Focus E15, the social housing campaign led by 29 mothers from Focus E15 hostel for young homeless people. The verbatim nature of the show puts these women at the centre. The use of monologue can make the piece feel one-note at times, but even if the theatricality is simplistic, Fysa’s approach to the complexities of the housing crisis is nuanced. The interviewees are well-chosen, ranging from other people evicted from London housing estates – which shows how far-reaching the problem is – to a woman working for the Citizens Advice Bureau. CAB’s resources are hugely stretched by increased demand since the financial crash, and she movingly details their attempts to help struggling individuals without being ‘counter-revolutionary’, inadvertently supporting the government by making the problems of their housing crisis disappear. The production has huge heart, telling the inspiring story of a victory against the machinery of local government without ever suggesting there are easy answers to be found here. 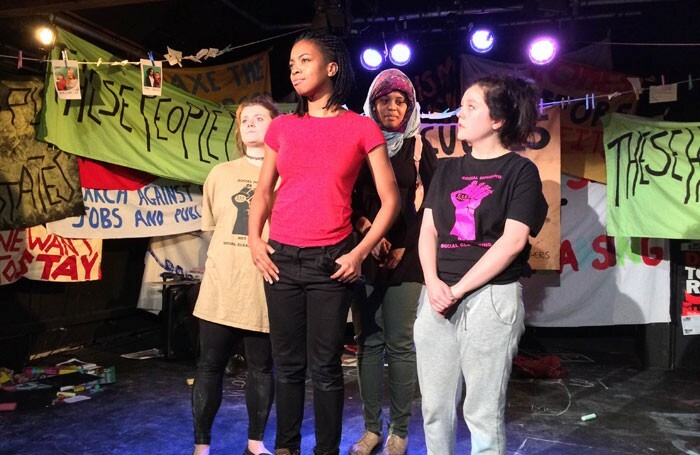 These young, talented performers bring the story of the E15 Mums to life with conviction and power – a story not just about the need for social housing, but the group of young women who found their voices as part of a protest movement. A moving verbatim piece by a talented young company which tells an important story with aplomb.